Initially, the Carter Family consisted of just A.P. and Sara. Born and raised in the Clinch Mountains of Virginia, A.P. (b. Alvin Pleasant Delaney Carter, April 15, 1891; d. November 7, 1960) learned to play fiddle as a child, with his mother teaching him several traditional and old-time songs; his father had played violin as a young man, but abandoned the instrument once he married. Once he became an adult, he began singing with two uncles and his older sister in a gospel quartet, but he became restless and soon moved to Indiana, where he worked on the railroad. By 1911, he had returned to Virginia, where he sold fruit trees and wrote songs in his spare time. A.P. and Sara re-formed the Carter Family with their grown children in 1952, performing a concert in Maces Spring. Following the successful concert, the Kentucky-based Acme signed A.P., Sara, and their daughter Janette to a contract, and over the next four years they recorded nearly 100 songs that didn't gain much attention at the time. In 1956, the Carter Family disbanded for the second time. Four years later, A.P. died at his Maces Spring home. 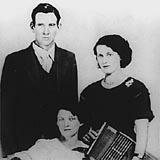 Following his death, the Carter Family's original recordings began to be reissued. In 1966, Maybelle persuaded Sara to reunite to play a number of folk festivals and record an album for Columbia. In 1970, the Carter Family became the first group to be elected into the Country Music Hall of Fame, which is a fitting tribute to their immense influence and legacy.